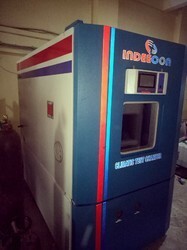 Leading Manufacturer of hot and cold chamber from Thane. External Housing Min 1.2mm thick cold rolled MS, exterior PC & internal of SS. We are highly acclaimed for manufacturing, trading and supplying Hot and Cold Chamber. Offered product range is of high quality and is manufactured in accordance with latest industrial standards. The fine quality raw material obtained from trusted vendors is utilized for its rigid construction while considering customers specification. These products are user-friendly and fulfill various industrial requirements.